The main camera functions are available via the Camera panel of the Scene Viewport: you can switch between cameras, add new cameras to the current world, open the Camera Settings window, and toggle the flashlight attached to the camera. Engine Camera created from the world script. 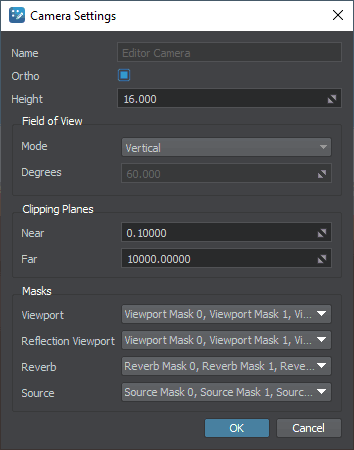 The view from this camera is rendered in a separate Engine Viewport, and you cannot change its settings via the UnigineEditor. This camera represents the current player. The Engine Camera can be changed via the script. Scene Camera created from the editor script. This is the default camera of the UnigineEditor. Both the Engine Camera and the Scene Camera always exist in the world. You can also add new cameras. Such cameras can be used as watchpoints in the world: you can position the cameras at different points of the world and then switch between them via the Camera panel of the Scene Viewport, when necessary. The number of cameras is unlimited. Change the position and orientation of the current camera by using the navigation controls. Position, orientation, and settings of the current camera are copied for the new camera. On the Camera panel, click . The new camera will be added to the list of the available cameras with the PlayerDummy name. At the same time, the camera will be added to the world as a PlayerDummy node. Change the default camera settings to the required ones. To set a new position and orientation for the camera, place the camera to the required position and adjust its orientation as necessary by using the navigation controls. All camera movements are immediately saved. Consider that when positioning cameras. You can also position the camera by selecting it in the World Hierarchy window and directly changing its transformation via the Parameters window. As settings of a new camera are simply copied from the current camera, you may need to change them via the Camera Settings window. To open the Camera Settings window, choose the required camera and click on the Camera panel. Settings of the perspective camera, in turn, depend on the Mode of the camera field of view: parameters defining the camera's viewing frustum differ. Name Name of the current camera. If you change the camera name, the name of the node (PlayerDummy) will be also changed. 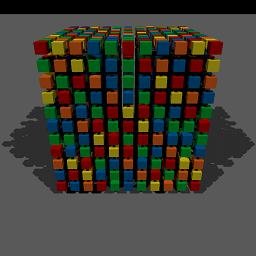 Ortho Toggles between the perspective and orthographic camera modes. Height Height of the viewing volume which is represented in the form of a rectangular parallelepiped. The width of the viewing volume will be equal to its height. The option is available only in the orthographic camera mode (the Ortho option is checked). Vertical FOV is used for the standard camera. In this case, the FOV is set in degrees. Degrees Camera's vertical field of view in degrees. This is the area that can be seen in the viewport (how many degrees the camera covers). Available for the camera with the vertical FOV only. Focal Length The focal length of the physically-based camera lens. Available for the physically-based camera only. Film Gate The film gate for the physically-based camera with horizontal FOV. Recommended value is around 0.1 units. Lower values decrease the depth precision of the scene and cause z-fighting, flickering and moire patterns. Higher values increase the depth precision. But they also cause objects in front of the camera disappear. Far Distance to the camera far clipping plane. It directly affects the light scattering results and the sky color. Recommended value is 10000 units (maximum up to 20000 units). Lower values are insufficient for proper light scattering and result in dark sky color. Higher values do not grant desired depth precision. Viewport A viewport bit mask for the camera that enables to selectively display objects, decals and lights in the camera viewport. If at least one bit matches, the object, decal or light will be rendered. The mask can be edited. Reflection Viewport A viewport bit mask for the reflection camera that enables selective display of reflections from objects. The mask can be edited. Reverberation A reverberation mask for the camera determines what reverberation zones can be heard. At least one bit of this mask should match the reverb mask of the sound source and the reverb mask of the reverberation zone. The mask can be edited. Sound A sound mask for the camera that what sound channels can be heard. If at least one bit matches the sound source mask, the sound can be heard. Each bit of the source mask specifies a sound channel. The mask can be edited. The view from each camera can be rendered into a separate Scene Viewport window. 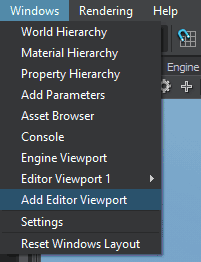 Add a new Scene Viewport window, choose Windows -> Add Scene Viewport. 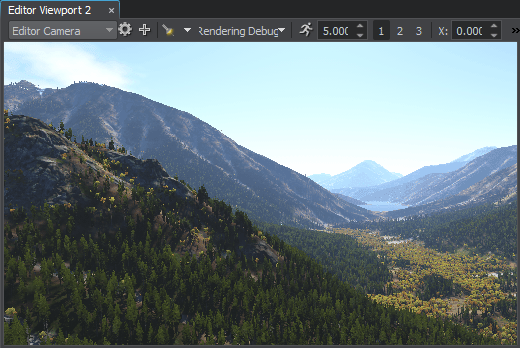 A new viewport named Scene 2 will open. Select the required camera to render the view from in the drop-down list of the Camera panel. You can change the camera at any time if necessary. The total number of viewports, that can be opened simultaneously, is not limited. Each new viewport window has the same functionality as the main Scene Viewport window. 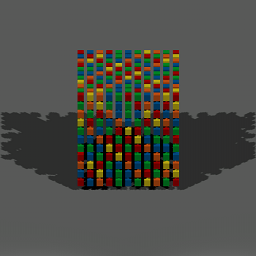 Each new viewport requires to render the scene one more time, which may lead to a performance drop. Don't forget to hide a viewport when it is not used, or remove it, when it is no longer needed. You can use several Scene Viewports to operate with several nodes located far away from each other, or to view different orthographic projections of the scene (Top, Front, and Side views). 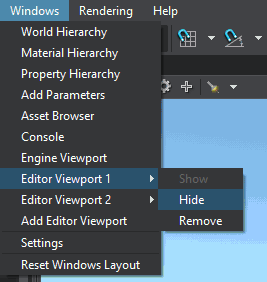 You can hide the Scene Viewport window and show the one that is hidden. 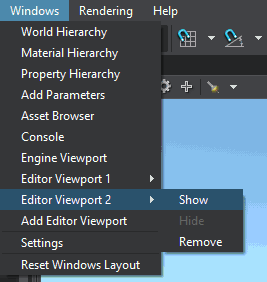 To toggle the Scene Viewport window, select its name in the Windows menu and choose Show or Hide. 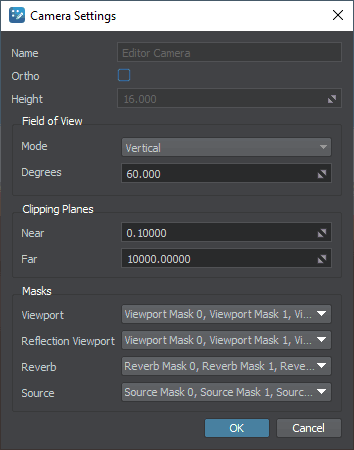 You can remove a Scene Viewport window when you no longer need one. 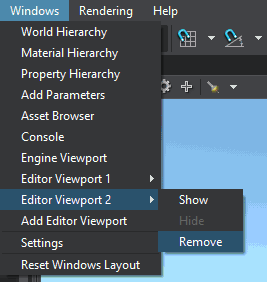 To do so, select the name of the Scene Viewport, that you want to remove in the Windows menu and choose Remove.